Ron, this is a relatively common problem with some of the older floor plans when the manufacturer tee’d off the cold input right at the water heater in order to feed another receptacle. You’re right on the money with the solution! Adding a check valve leading directly into the cold inlet at the rear of the water heater will indeed negate the migration of heated water out of the heater through the cold inlet. This process is exacerbated by a siphoning effect when you open the cold faucet to the sink. I do recommend a brass check valve, however. Stay away from the lesser-expensive plastic check valves. They have a history of distorting and for chronic failure when positioned near a heat source, (the hot water in the heater). Some plastic check valves, (or any type of valve for that matter), can fail and remain permanently open OR permanently closed due to the deterioration of the internal seals. 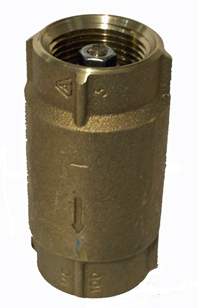 Your best bet is with a brass check valve. Hmm...ever thought about becoming an RV service technician? It seems you have a good foundation of correct troubleshooting skills! Congrats!